Ian posing on his homebuilt recumbent lowracer. I'm sitting to write this a day after being paid a huge compliment. A friend upon seeing the bike for the first time exclaimed, "Wow!" and asked, "Isn't that what they call..." furiously searching for an appropriate descriptive, "...a C5?" And this, just a week after taking part in a discussion of that very machine on the Atomic Zombie Forum! An insult to many quite possibly and whilst the lowracer may be one wheel, an electric motor and a sleek body shell short of a real Sinclair C5, having been a 9-year-fan of Sir Clive's creation back in 1984, to now have built my own recumbent cycle and have it even loosely compared...well, you get the picture. I'd been toying with the possibility of owning a recumbent for a good chunk of the last decade after finding Velo Vision magazine. 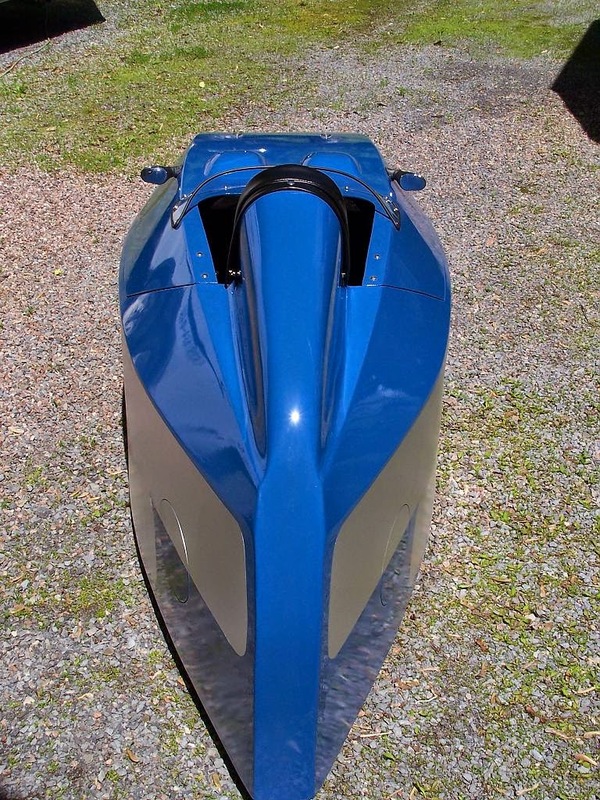 A chance online discovery of modern velomobiles led me to a Dutch company who sold the Alleweder velomobile in kit form along with plans for a 20/26 'bent. 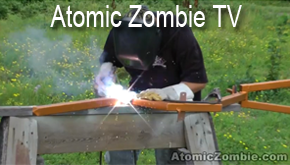 Searching further online for bike plans led to Atomic Zombie's website and whilst none of the bikes at the time suited, the notion that people were building their own kept me interested. Every return visit to the site revealed a new model and when the Warrior was released, Atomic Zombie really had me hooked. Here was a serious bit of kit! 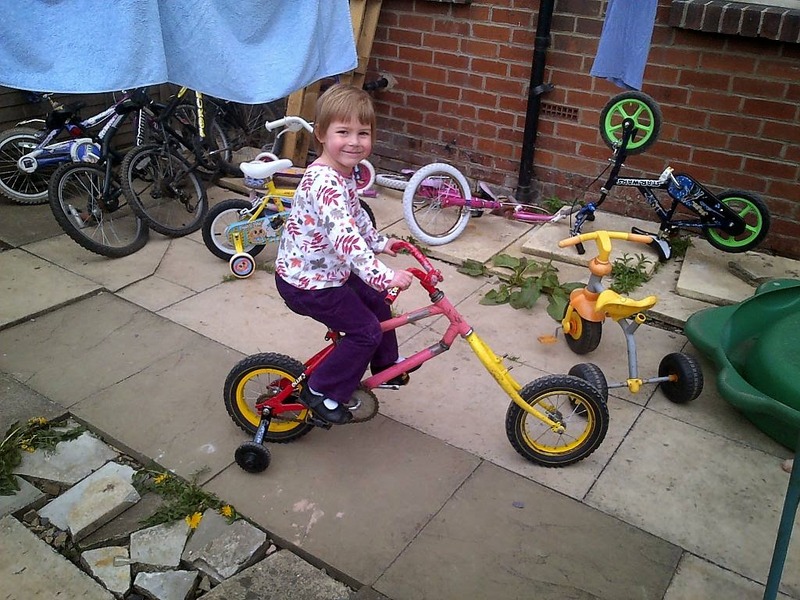 This is first ever attempt (more of a mess around than anything) by putting adult bike forks on kid's bike. Building bikes isn't just for the young at heart. It's a past time that youngsters can participate in and learn some skills along the way. 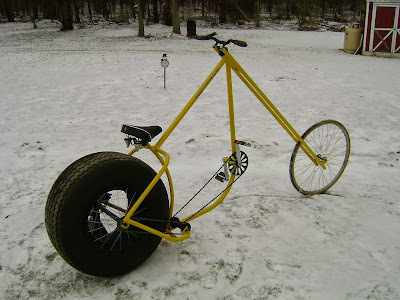 I built the one with my middle daughter using Land rover steering arms on forks. For this one, I used scrap air pipe from work (to build the) forks. 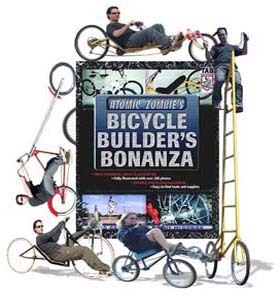 See more than 4,000 custom built rides: recumbents, trikes, tandems, choppers, electric, tall, cargo, motorized and fun bicycles at the AtomicZombie bike builders gallery. John "Doc" Warner shares some photos of his modified bicycle for Gravity Bike competitions. 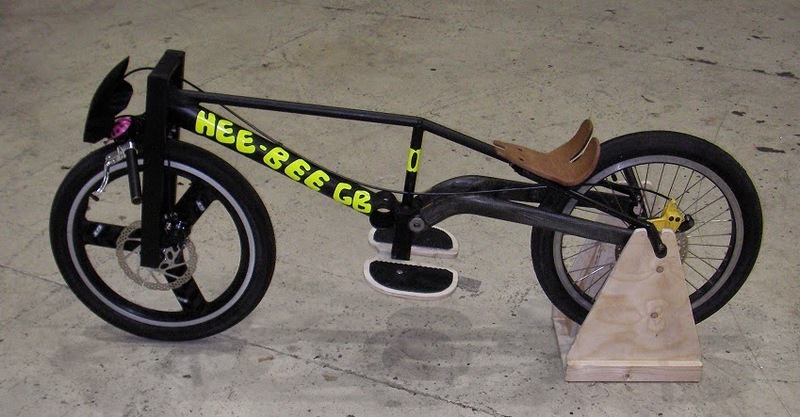 Named "Hee-Bee GB II", Doc built the gravity bike for a competition this past May. What is a gravity bike? 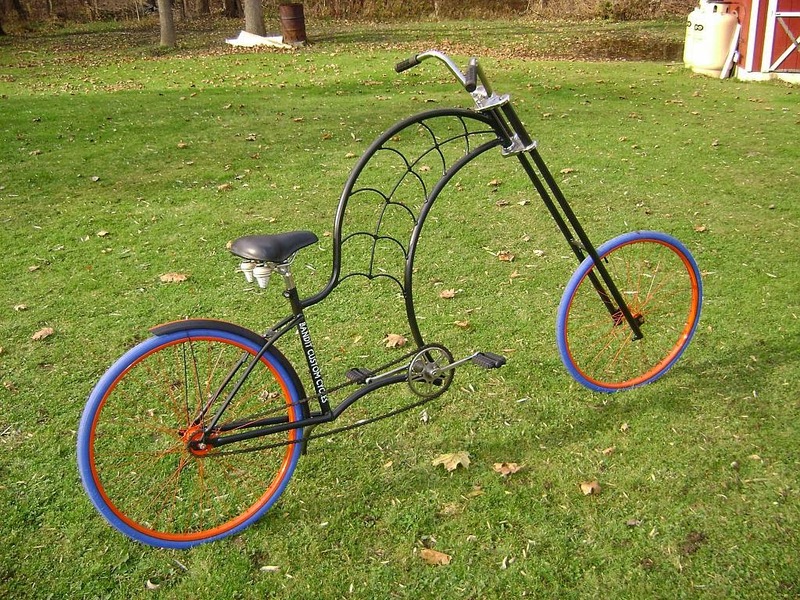 A modified bicycle with a frame that's low to the ground to reduce wind resistance and the center of gravity. 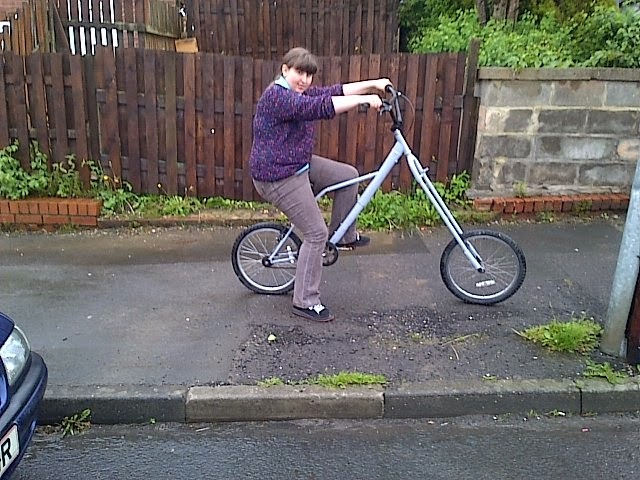 It has narrow handlebars, no pedals or chains, front and back disc brakes, knee rests and long foot pegs so the rider stretches out horizontally. The goal is to descend steep downhill courses to reach insane speeds, often exceeding 90mph. This extreme sport has been gaining popularity worldwide for more than three decades and Gravity Bike races are held around the world. Competitors wear helmets (some races require full-face), leathers, speed suits, gloves, footwear, and elbow and knee pads. According to Doc, "It's a great sport, very cheap (to build and compete), fantastic fun, and very accessible to all abilities and ages. Perfect for DIY/home-builders. You can build a competitive bike for around £60/$100 (but) you can, of course, spend less, or much more. "This is my first Gravity Bike build. I made it earlier this year to enter the 2014 Penn House Gravity GP and finished second overall (Streamlined Buggy beat me by just over a second)." See more pictures of Doc's Gravity Bike in the builders gallery. To learn more about Gravity Bike racing, search for phrases such as "gravity bike competitions" in your web browser and check out these links: www.pennhousegrandprix.co.uk and www.facebook.com/PHGGP . Fantastic detail on this one-of-a-kind chopper. New Yorker and AtomicZombie member, Kempracing, has an addiction. But, don't worry, it's a good one. He loves to design and build choppers. It doesn't matter if they're on two wheels or three. Each one is unique. Kempracing puts a lot of thought and care into his bikes. Nice tribute to our own OverKill! 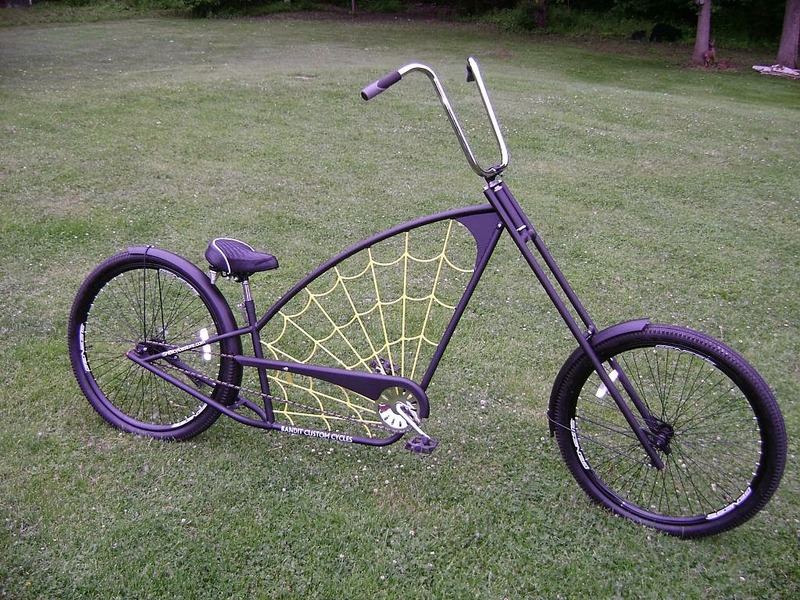 Check out the detailed web design of the purple chopper above. He built and donated that chopper for a raffle at the Howe Caverns Bicycle Show and Swap Meet in New York this past July. A lucky winner pedaled off with that beauty. A trike for the Mrs.
An embedded star burst heart on the trike he built for his wife, Patty. Awww. Couldn't wait for paint. Gotta take it for a test ride. Trying out something different with rear phat tire. 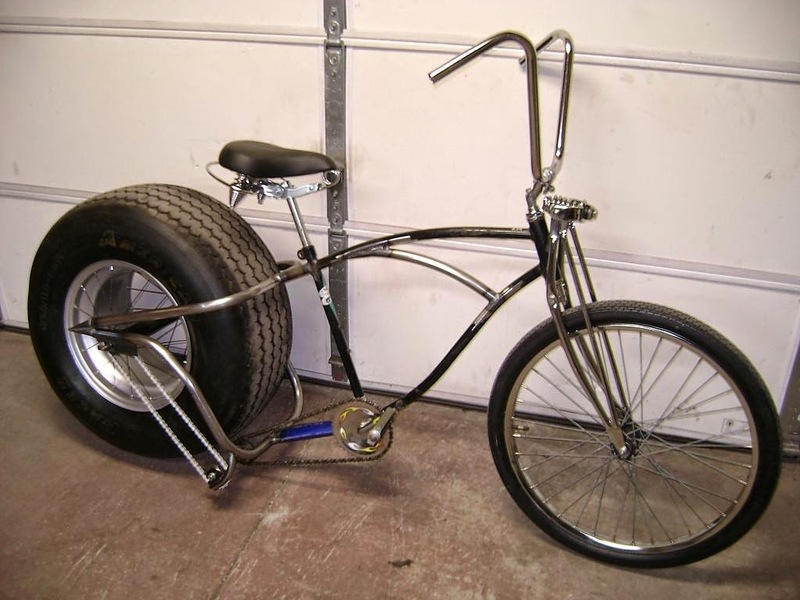 Interesting tires and matching spokes. 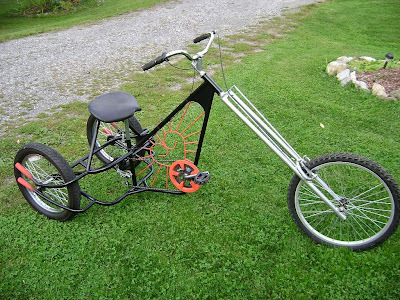 See more of Kempracing's custom built choppers. We invite you to add photos of your own handmade bicycles in the AtomicZombie builders gallery. Victor Hugo of Mexico is at it again! 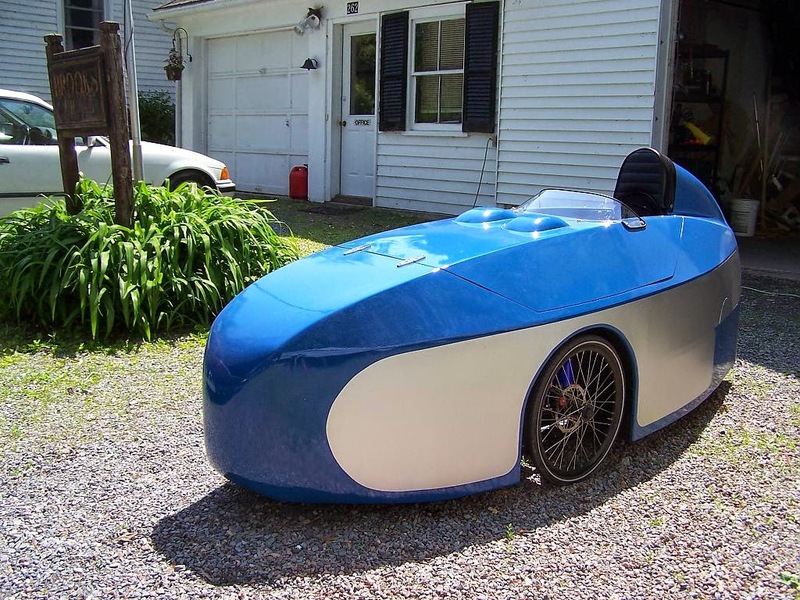 The custom bike builder reveals his latest project, Dany-Footbike. Victor adds flair to his projects. Victor is known for creating radical bicycles that are not only functional, they are also visually appealing works of art. Check out the detail on the platform. You can see this and other cool custom bikes at the AtomicZombie builders gallery. 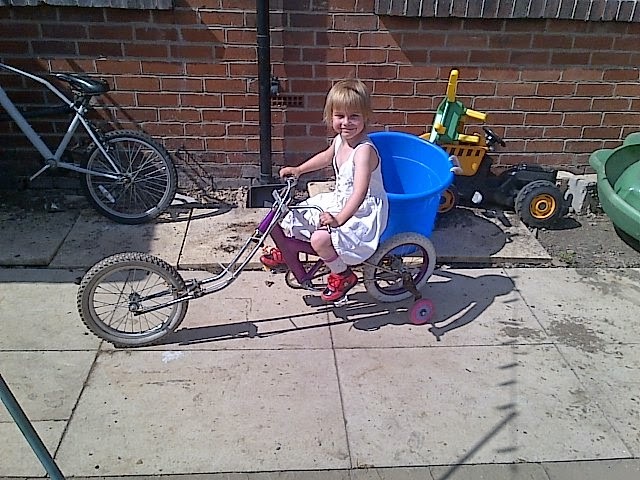 "We built this because my youngest two kids needed bigger bikes and they both love workshop time with daddy. One of the kids from school turned up on a shop built chopper, so Tay looked it over and said, "Me and my dad can build (one) better." We've built all sorts from scrap wood and metal and they have even helped me with rebuilding an old Land rover. The forks are made from 16mm od x 8mm id blow pin shafts left over from machine re-furb at work. Suspension is made of old trampoline springs I found. The handlebars are from an old rotavator which I'm planning on using engine on quad-cycle (so many ideas, so little time). I had to turn some sleeves to fit them as id was bigger than od of forks. Tay helped with drilling on lathe. 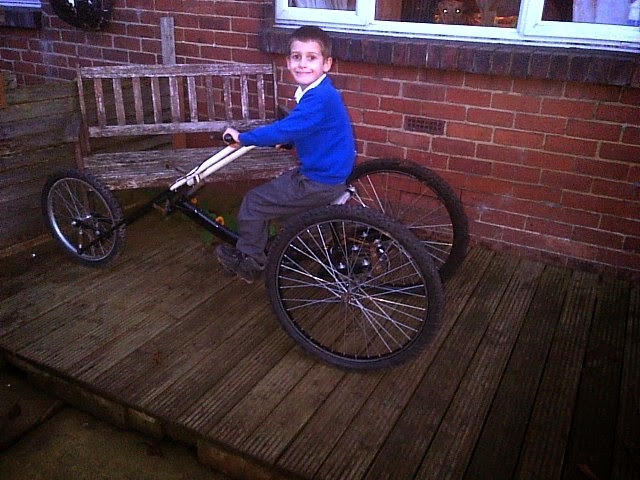 Front wheel is 20" and back started as the same size, but are now 26" as we needed the smaller one for his little sister's trike. I just wish he would let me finish painting it, but he's too busy racing on the road with his mates! I am impressed with how tight a turning circle it as and how fast he can go." 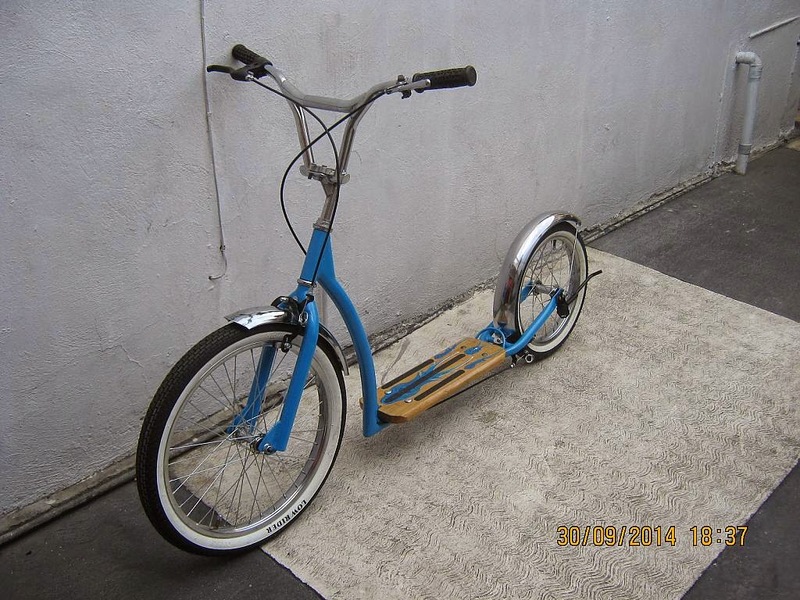 AtomicZombie forum member, Canvasman, is crazy about trikes and velos. 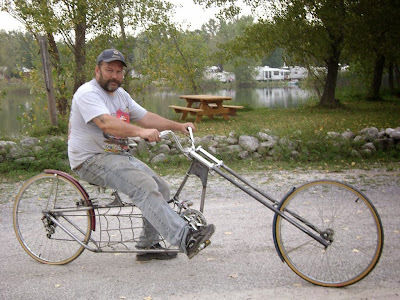 Check out his latest velomobile. It's a beauty! Stylin' handmade velo named Max. 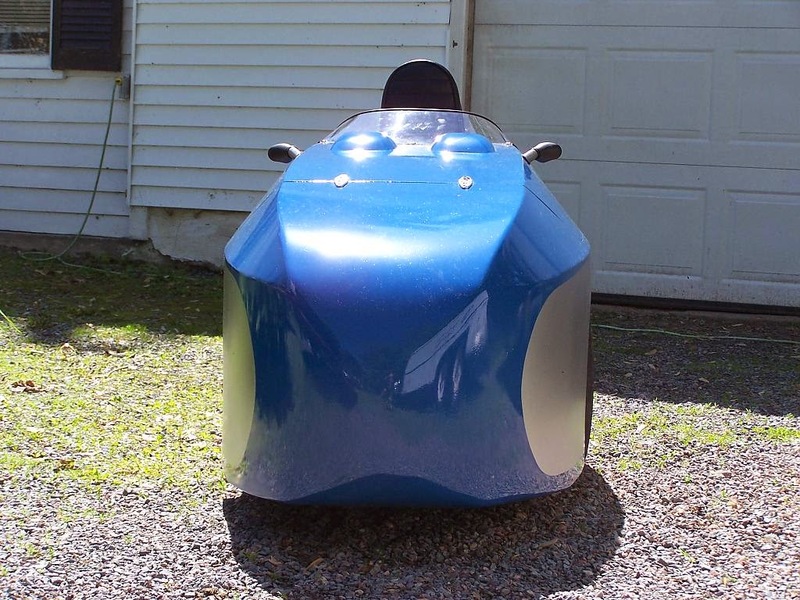 "New this spring, molded fiber glass, plywood & Dacron. 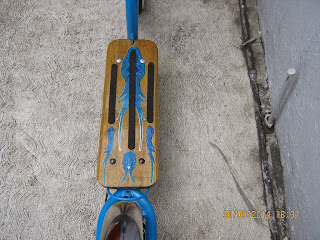 On a Performer trike, rear wheel 700c. Hit 38 mph today." Check out the aerodynamic lines of this baby! This velo is a functional, sleek work of art. Congratulations on a job well done! 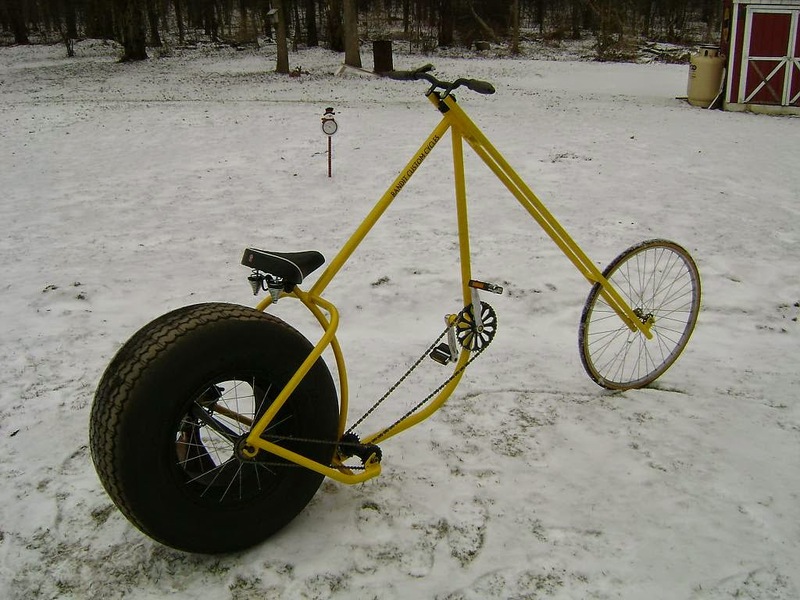 See more of Canvasman's bike creations in the AtomicZombie builders gallery. 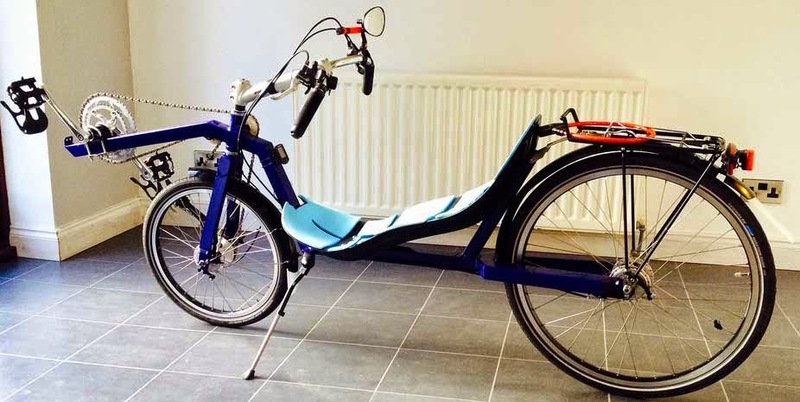 There are more than 4,000 photos of recumbents, trikes, tandems, tall bikes, ebikes, cargo bicycles, trailers, velomobiles, kids' bikes, fun bicycles and more. 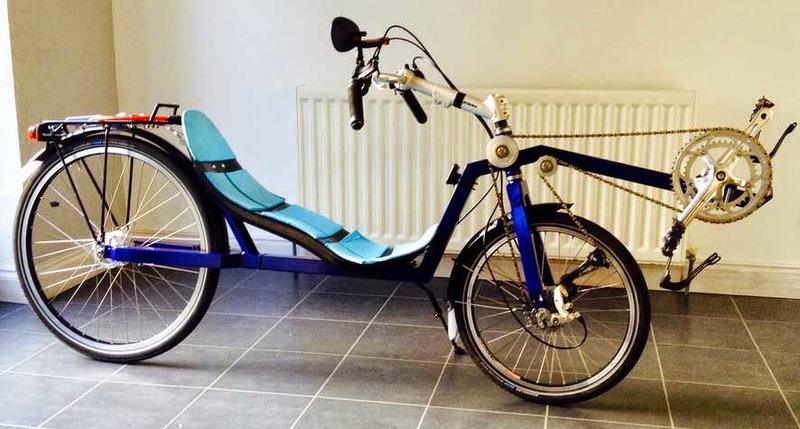 Bike builder Swizz69 of England, UK, shares photos of his recently built recumbent lowracer @ the AtomicZombie builders gallery. It's a beauty! 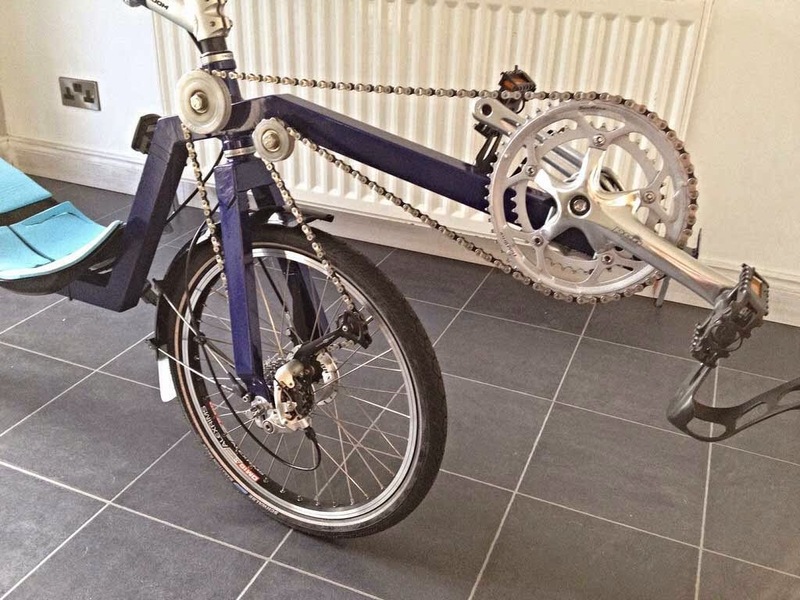 "Whilst not a AZ design, it was built with much Zombie inspiration, with 40mm mild steel tube frame and fwd forks, Ocean Cycles seat, Tandem Stem, Sturmey Archer drum braked hubs, Marathon Racer tyres. (It) rides nice and the front wheel drive works well." 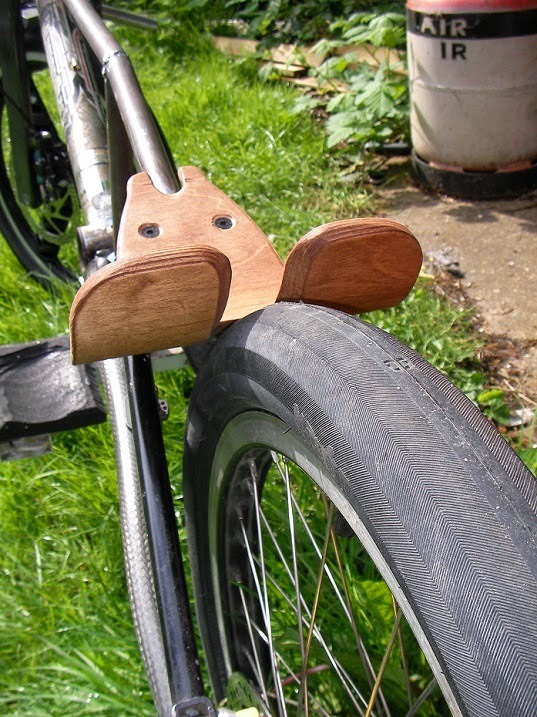 "I mounted the panniers reversed so the heel cutout faces the rear. Apart from looking better it keeps more of any weight carried within the wheelbase. 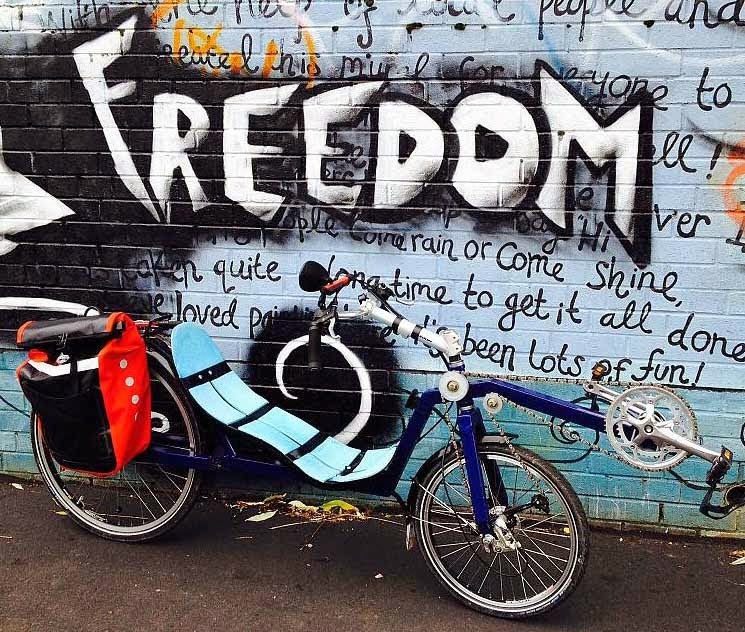 On a grocery trip with both bags loaded the bike handled fine, if not slightly better." 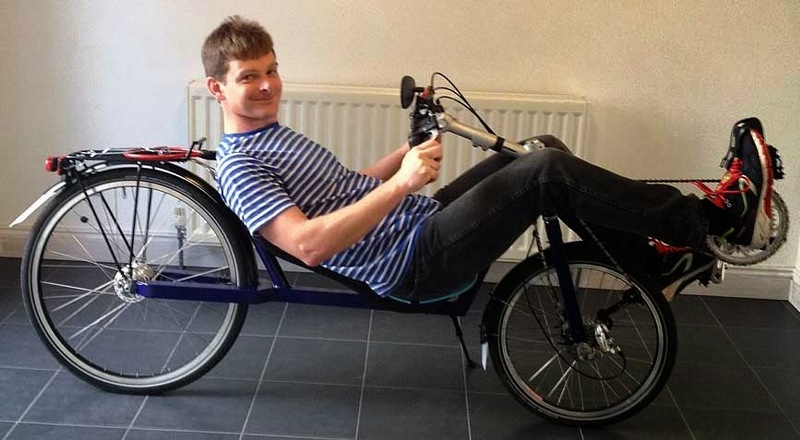 What a great-looking recumbent. Kudos on your fabulous project!